I have kicked my bad habit with a click of a button! 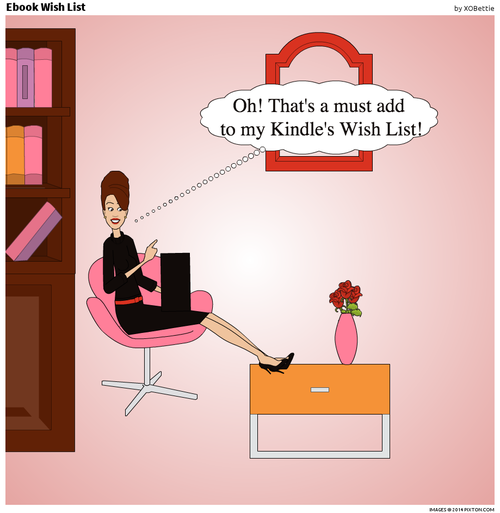 Previously, I compulsively bought Ebooks at every opportunity my Kindle provided me. 1. I bought my Kindle paperwhite to have ads on the home screen. Little did I know about daily deals and how I can buy one with a click! 2. Whenever a book I’m reading mentions another book, I can click on the title and have a new edition to my library almost instantly! 3. When I finish a book the Kindle shop overrides my reading experience to suggest similar books, which its algorithm and I agree I are must reads! My wallet found salvation from my shopping storm in my Kindle’s Wish List feature and my library’s Ebook loaning system. Instead of buying at every opportunity, I add an intriguing book to my Wish List. When I’m ready to read another book I click on my Wish List. Before buying the book from Amazon, I double check my library’s website to see if it is available. If so, I’ve saved some $$! If not, I buy it from Amazon—and add any suggested reading to my Wish List.